This month, I’m sharing two inexpensive products and three free apps. I’m always looking for non-toxic products, and those containing charcoal are at the forefront for many companies. Charcoal is a safe way to gently detoxify and clean. I’ve discovered two new products, readily available on Amazon that are really cheap but really effective. Two of the apps I’ll share are ways to “earn” money when grocery shopping, and who doesn’t want that?! The third is an app to make your journaling life easier. 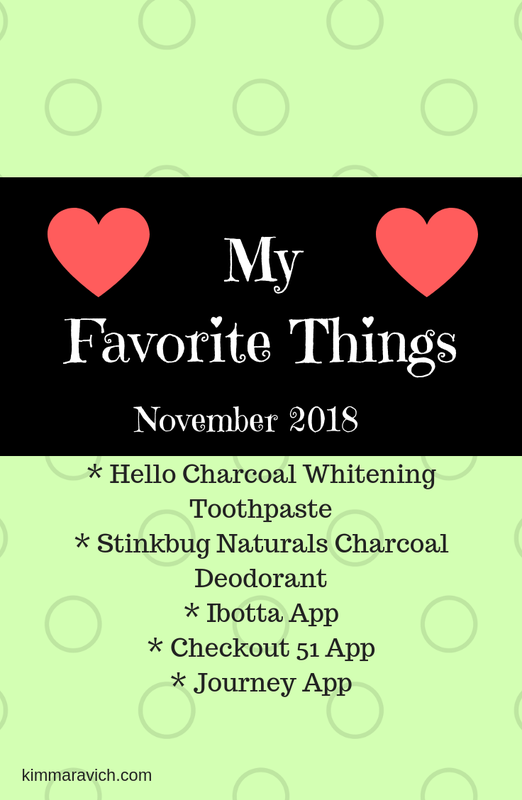 I hope you enjoy reading November’s list. Despite its black color, this toothpaste will turn your teeth dazzling white. Plus, it tastes minty fresh. I love this so much because it contains no peroxide, fluoride, artificial sweeteners, sls/sulfates, or dyes. (If you want to read more about why I advocate for fluoride-free toothpaste, click here.) Charcoal toothpaste will help clean and detoxify the mouth and teeth and works to remove surface stains. It will slightly discolor your toothbrush, but this two-pack comes with it’s own special toothbrush. The paste WILL wash out, however, if you get it onto clothing or towels. This combo pack runs for around $15 on Amazon, but you can get a single paste tube as an add-on for dirt cheap. You can also find it at Target for less than $5. In a previous “Favorite Things” post, I wrote about the regular lavender-scented Stinkbug’s deodorant. Well, this product trumps that by far. This charcoal deodorant has the same wonderful scent, but it reduces perspiration as well. The charcoal helps to harbor moisture, leaving you feeling less sticky. Natural deodorants are a go-to for those wishing to refrain from aluminum and other harmful chemicals found in traditional deodorants, but they have notoriously been known to leave you with sweaty pits. Charcoal is the solution we’ve been looking for! You can find this on Amazon for around $8, but it’s becoming more popular, and you may be able to find it at your local grocer or retailer as well. Speaking of grocery stores, if you’re wanting to earn back some money you spent shopping, Ibotta is the app for you. You can earn a couple different ways. One way is to upload your receipt after you shop. If you’ve purchased one or more of the products featured on the app, you’ll be able to redeem money. (I’ve seen redemptions for as much as $5 depending on the product purchased.) Another way is to link a loyalty card. My local grocer has a card that I swipe prior to paying for my groceries. Often grocery stores will give you coupons that way or may help you earn points for gasoline. With Ibotta, before you shop, you’ll go to the app and add offers on great products by clicking on the product photo and redemption coupon. There are also online vendors from which to shop including Amazon and Groupon. Once you reach $20 of earning redemptions, you can cash out and money will be sent to you via PalPal. (You can read more on Ibotta’s website.) Since joining in early 2017, I’ve earned $171.20 … and I definitely don’t even use it every time I shop. Checkout 51 is similar to Ibotta, but you’ll upload photos of your receipt after you’ve shopped. Prior to shopping, I take a glance at the week’s products and redemption values. Unlike Ibotta’s coupons that last for up to several months, Checkout 51 has new deals each week that expire on Wednesday evenings. The weekly approved items are largely groceries, but there are some personal care items as well. I don’t find quite as many deals here, but it’s still an easy way to earn money just by shopping for products that were probably already on your list. Like Ibotta, you can cash out once you’ve hit $20. (See Checkout 51’s website for details here.) To date, I’ve earned around $66. A friend recently told me about this app, and it’s great. The Journey app is a free online journal and diary. There are upgrades for purchase, but I find the free version is good enough for me. I love to keep a gratitude journal, but that typically involves sitting down with a pen and notebook, and finding a designated quiet time. Life for me right now, with two little boys ever at my feet, doesn’t allow for free-time for thoughtful journaling. However, I can pull out my smart phone as I sit on the couch with them or watch them play at the playground. I can even use talk to text, which makes journaling super quick! This app allows you to type entries by date and even upload media like photos and video. It’s a great way to practice gratitude and/or to keep a chronicle of the days’ events. There are also ways to sync the app with other devices which allows for printing and/or access to the journal besides just on your phone.